If you are looking for something quick and nutritious for breakfast, a snack, or (like me, this evening) for dinner, consider this: A toasted plain bagel, delicious dairy-free plain cream cheese from Kite Hill, and fresh fruit. I sprinkled a little chia seed for extra nutrients. And, because February is heart health month, it’s important to note: it’s all cholesterol free, thanks to the almond-milk-based cream cheese and accidentally vegan bagels from Costco! This crust meets all my criteria! Quick and easy with few ingredients, vegan and no oil!! Forks Over Knives friendly, and best of all, Esther Approved!! From Esther’s Kitchen: Here is a super easy method to make a 12″ thin pizza crust! This recipe is for the crust with suggested topping ideas and baking times. The crust is oil-free, thin and crispy with some air pockets that firm while baking. You can have a homemade Esther Approved pizza in 30 minutes! Enjoy! 1. Place the warm water in a small bowl. Stir in the granulated sugar until it is dissolved. Stir in the active dry yeast. Stir quickly to combine. Let the mixture sit undisturbed for 10 minutes. The surface of the water will begin to foam around 10 minutes. Your yeast is proofing in this step. 2. Add the all-purpose flour and salt to a large mixing bowl. Stir to combine. Pour the water/sugar/yeast liquid in with the flour and salt. Stir the dough with a spoon until a dough ball forms, about 1 minute. 3. Lightly flour your worksurface. Grab the dough and little bits of dough from the mixing bowl. Transfer the dough onto the floured work surface. Knead the dough with your hands for 1 minute until it is smooth. The dough ball will be stiff. Let the dough ball rest for 5 minutes. Roll the dough out to a 12″ circle with a rolling pin. Start from the center and apply pressure as you roll out to the edge. Flip the dough over a few times while you are rolling it out. 4. Transfer the pizza dough to a pizza pan. Add the crushed tomatoes in a thin layer, minced garlic, salt, ground black pepper, pizza seasoning blend, crushed pepper flakes and Esther Approved cheeze. 5. Bake the pizza in a preheated 450°F oven. Bake the pizza for 10 minutes or until the crust is crispy. Add fresh basil leaves on top of the pizza. Slice and serve. Here is a super easy method to make a 12″ thin pizza crust! This recipe is for the crust with suggested topping ideas and baking times. The crust is oil-free, thin and crispy with some air pockets that firm while baking. You can have a homemade Esther Approved pizza in 30 minutes! Enjoy! Please visit Esther’s Kitchen for more great recipes! Happy Cinco de Mayo! Our beans are cooked from Esther’s Crockpot Beans recipe that we shared yesterday. Here is an easy baked Mexican Rice that does not require any frying. This Mexican Rice is similar to the type you enjoy in Mexican restaurants. Rinsing the rice in a fine mesh colander helps to removed excess starch and lends a fluffier rice. Enjoy! 1. Preheat the oven to 350°F. Spray a 9 x 13 baking dish. Set aside. 2. In a blender or food processor combine the jalapeño through the S&P ingredients. Purée until smooth. 3. Pour the 2 cups vegetable broth in the baking dish. Add the rice and puréed veggies. Stir in the corn, carrots and green beans. 4. Cover the dish tightly with aluminum foil and bake for 45-60 minutes or until the rice is cooked and most of the liquid has been absorbed by the rice. 5. Serve with additional fresh cilantro, salt and pepper to taste. For our next Cinco de Mayo recipe we have Bean Burritos with Green Tomatillo Sauce. We used the beans from Esther’s Crockpot Bean recipe. You may also use canned vegetarian refried beans. Note: 1 (15 oz) can will yield about 1-1/2 cups of beans. This recipe comes together quickly with store bought green chile or tomatillo salsa. Enjoy! 1. Preheat the oven to 350°F. Spray a 8×8 or 8.5×12 baking dish. 2. Pour 1 cup of the green chile salsa on the bottom of the baking dish. 3. Add 3/4 cup refried beans into each tortilla and fold into a burrito. 4. Place the burritos in the baking dish. Pour 1 cup green chile salsa over the burritos. 5. Sprinkle the Daiya shreds on top of the burritos. Bake uncovered for 35-45 minutes. The burritos will puff up. 6. Serve with fresh cilantro. We are having a rough week, here at The House of 9 Lives, as we lost our precious dog Trixter over the weekend. So, thanks to Chef Linda at Esther’s Kitchen for sharing this recipe, as it looks like great comfort food in the making. 1. Combine all ingredients in a large crockpot. Toss any floating beans. 2. Set the temperature to high and cook for 4 hours. After 4 hours turn down the temperature to low. Cook for 2.5 more hours. Remove the lid. Remove the excess water on top and reserve the water. 3. Using a hand immersion blender or hand masher, mash the beans to your desired texture. Add more water back to the beans if you desire a runnier style bean. 4. Note: If you are using these beans for burritos, do not add additional water while mashing the beans. Serve the beans plain or sprinkled with a non-dairy cheese. Adjust the salt and other seasonings to taste once the beans have been mashed. ANOTHER winning recipe from Esther’s Kitchen!! 1. Add the following ingredients in the mason jar in this order: oats, flax meal, cinnamon, nutmeg, peanut butter, maple syrup, banana slices, walnuts, plant milk. 2. Tighten the seal and lid on the jar. Place the jar in the refrigerator overnight. 3. Stir or shake the next morning before eating. Word is this tastes like banana bread with peanut butter. What’s not to love about that?!?! And, follow Esther’s Kitchen here! 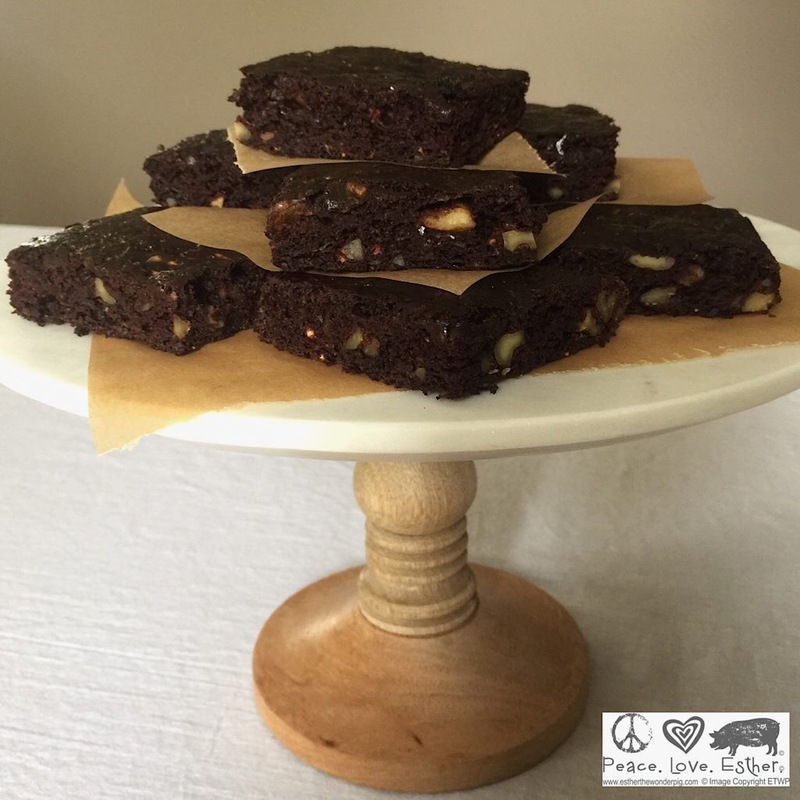 Another winning recipe from Esther’s Kitchen! 1. Preheat the oven to 350F. Spray a 8″x8″ baking pan or line the bottom with parchment paper. 2. Add all the dry ingredients in a mixing bowl. Stir by hand with a spoon. 3. Add the zucchini, vanilla extract, oil and almond milk. Stir until the batter with a spoon until the batter is smooth. Keep stirring. The batter does come together. If your zucchini is not wet, stir in an additional 1-2 Tablespoons of almond milk. 4. Pour the brownie batter in the pan. 5. Bake for 20 minutes or until the center is done by using a toothpick test. 6. Cool and slice into 9 pieces. 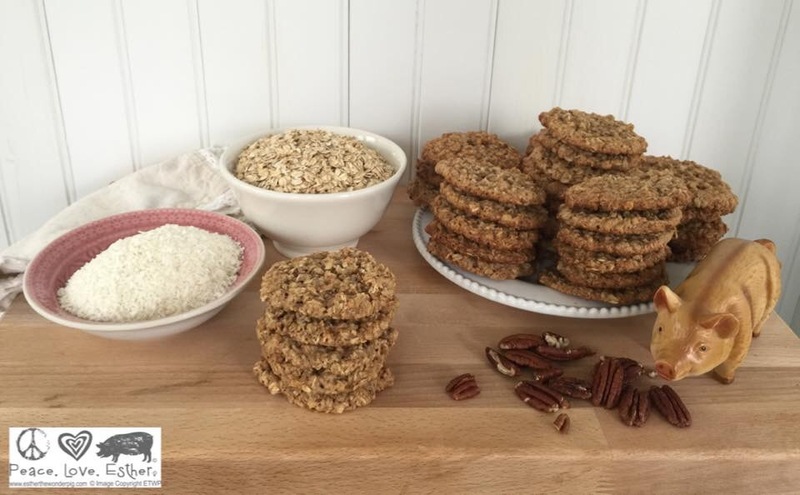 Coconut Pecan Oatmeal Cookies – Esther Approved!! 1. Set the applesauce aside. Make your flax eggs in a small bowl and set aside. 2. Melt the Earth Balance on the stovetop or in the microwave. Add the vanilla extract and flax eggs. Stir to combine and set aside. 3. Combine the remaining ingredients in a large mixing bowl. Stir the dry ingredients with a wooden spoon. Stir in the melted butter mixture for a few minutes until the cookie dough is combined. Stir in the applesauce until the dough is moistened completely. 4. Line 3 cookie sheets with parchment paper. 5. Using a soup spoon, spoon 12 dough rounds onto each cookie sheet. Bake for 12-14 minutes at 350F. Allow the cookies to cool on the cookie sheet before transferring onto cooling racks. The cookies will slowly crisp up on the cookie sheet which will allow you to transfer easily onto the cooling racks. You can follow Esther’s Kitchen on Facebook, here. For the Facebook feed of Esther the Wonder Pig, click here. You might also enjoy Happily Ever Esther Farm Sanctuary, here. It’s National Sticky Bun Day!